I get quite a lot of queries on how to buy my book Wine Science. In the UK, this book was published by Mitchell Beazley in November 2005. It sold pretty well, and the initial print run all disappeared. Will they reprint it? Probably not, was the answer I got. They aren't very good at responding to emails, and so I don't know whether it's officially out of print, or whether I can get back the rights to publish it. But whatever the situation, the result of this is that you can't get hold of it in the UK or most other markets (although I recently found out that http://www.aroundwine.com/ have some copies still). Amazon.co.uk list it as out of stock. 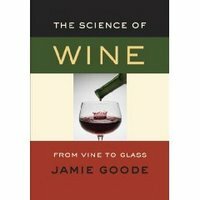 In the USA, it was published in March 2006 as The Science of Wine. Different cover, too (pictured), but exactly the same content. They sold through their initial order of 5000 and have since ordered two more runs of 4000, which is good, but I don't get very much for each copy sold (just 10% of gross receipts received by Mitchell Beazley, who sell them the books very cheaply). The good news is that it's very cheap to buy the book from amazon.com in the USA and then get it shipped to the UK. Cheaper, even, than it was to buy the book in the UK when it was still available here. I just checked on amazon.com and the cost was £17.82 delivered. The link is here. I know I should not make a commerical plug on your blog, but I did order a large number of copies for my mail order book company. I was going through the storeroom last weekend (to find a book for a friend which I failed to do) and cam across a box of your books. I think I have half a dozen copies left and can probably do a deal on them. Ordinarily, I hang on to these hard to find books and sell them to people in the trade as they ring me up looking for them. Also, thanks to City's goalie (he is my reserve behind Portsmouth's James) this weekend, my Fantasy team score looks a lot healthier! I can't say how much I enjoy your book--I refer to it constantly. I found it easy enough to get through Amazon here in the US; worth doing for those out there who can't otherwise seem to find a copy. Not exactly relevant to this topic but perhaps just as good an opportunity to give words of praise and congratulations to you on your book being translated into Japanese. Really hope it will outsell the US. I sincerely think the book will benefit the winegrowing community here as well as deeping consumer knowledge on wine appreciation. And, any plans to update the book? A few issues you have dealt with in the book seem to have considerable development in the past two years. I was pleased that the book has been translated into Japanese, and according to a contact there, apparently a good job was done. Paul, City performed well yesterday - but I don't think Joe Hart had a single shot on target to save! The only UK source of (the American publication)of your book advertising on abebooks.com is charging £30 for a copy. Looks like the price may be being driven up by scarcity- bit like a Bordeaux 1st growth? Don't want to upset you but I bought my UK copy from Galloway & Porter in Cambridge for £7.99 a year ago..
Perhaps not the place, but I'll take the opportunity anyway to tell you how much I appreciate your book. No book has helped me more in my quest to "understand wine". It has dissolved so many myths and still fueled my motivation. I recommend it to anyone trying to get into wine as a complement to traditional wine literature. Now £18.58 at today's exchange rate!